Deciphering the mysteries of the skies has over the centuries been one of the great challenges of many scientists and great men (and women). The development of astrophotography was crucial for delving further into this knowledge: it allowed people to observe the sky without literally observing it. In other words, it gave them a permanent reference that helped astronomy to take giant steps forward. The first techniques that allowed images to be captured and preserved emerged in the early 20th century. However, this process had nothing to do with the modern-day facilities available for becoming an astronomical photographer: a reflex camera and a telescope, for example. The first techniques combined the fundamentals of chemistry, art and astronomy. Thus, the birth of the daguerreotype (crucial for the consolidation and spread of astronomical photography) allowed the first images to be taken of the moon, as well as what today are considered the oldest human portraits in history. After the Sun and Moon came Vega, the first star to be photographed. It was the joint work of the astronomer William Cranch Bond, the first director of the Harvard College Observatory, and John Adams Whiple, American inventor and photographer, pioneer in the development of astrophysics and night photography. They also used a daguerreotype to take Vega’s “portrait”. But of all the stars in the universe, why Vega? It is the second brightest star in the northern hemisphere (after Arturo) and the fifth brightest in all the night sky. 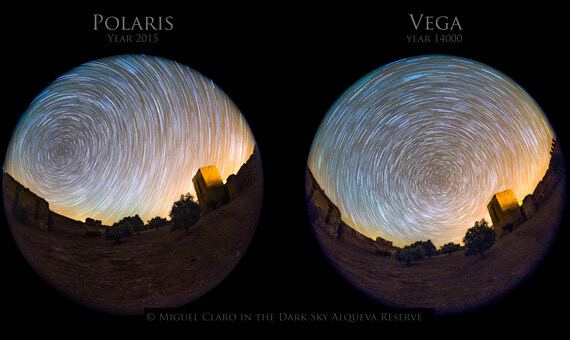 Vega was the polar star (Polaris) thousands of years ago, and will recover its former status around the year 14000. How is this possible? The polar star is the one that is located closest to the North Pole, and Polaris has not always been there. The change in roles is the result of the phenomenon known as precession of the equinoxes, as explained by the blog “la bitácora de Galileo”, which would consist of a circular movement of the earth’s axis (similar to that of a spinning top), due to the gravitational influence of the Sun and Moon, among other factors. It is some 25 light years from the Solar System. It has a diameter 2.7 times bigger than the Sun and is 2.5 times more massive. Its real luminosity is nearly 40 times that of the sun, so if it replaced our Sun, it would burn us up in a few thousands of a second. Both Vega and the Sun have reached around half their lives, although Vega will die sooner, as it consumes its energy quicker (as it is more massive). Vega is much younger than the sun (it is a tenth of its age): 4,000 million years. 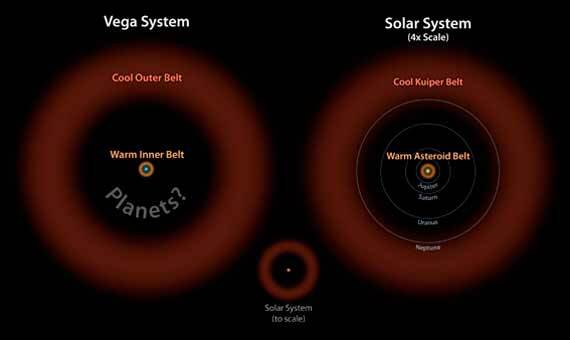 As well as being a reference point geographically (due to its “traveling” position as Polar Star), Vega was literally taken as a reference for establishing what was considered the zero value of star size (or the apparent brightness of a star), although later this scale fell into disuse, as there are more precise measurements. Summer nights are made for seeing stars, and in fact they are the best time to observe Vega, the brightest star in the central months of the year (summer in the northern hemisphere and winter in the south of the planet). Also at this time you can see the Summer Triangle, an asterism that is triangular in shape and reigns in the boreal sky. It is made up of three stars, each forming part of a different constellation. Thus, Vega (Alpha Lyrae or constellation of the Lyra) shares its throne with Deneb (Alpha Cygni) and Altair (Alpha Aquilae). Aside from its scientific reality, everything that happens in the sky has over history had a mythological interpretation. What’s more, today we still gaze at the sky with major gaps in our knowledge and allow stories and fiction to provide us with the answers we have not yet found by scientific means. The case of Vega is no exception. 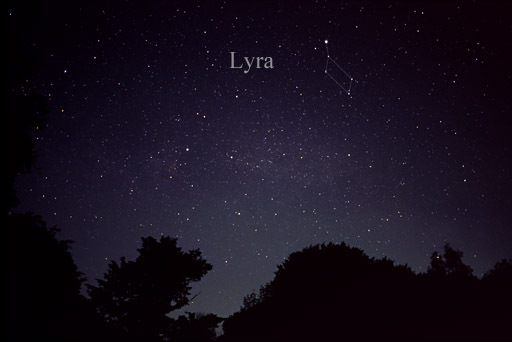 The brightest star in the constellation of Lyra is the protagonist of a romantic story in Chinese and Japanese mythology. For Asians, Vega would be a young girl in love (each culture gives a different name to the players involved), separated from her loved one (Altair) by a great river (the Milky Way). However, on the seventh day of the seventh lunar month (between July and August) the Milky Way is weaker (due to light conditions), allowing the “re-encounter” between the two stars, joined by a kind of bridge. Thus, once a year the lovers can meet again, at least for a short period of time. The day for lovers in China commemorates this encounter and is celebrated on the seventh day of the seventh month. But Vega is not only the protagonist of ancestral and romantic stories. More recently, the cosmologist and popular science writer Carl Sagan also used it as the inspiration for his novel “Contact” (1985), later adapted for the Hollywood screen (Contact, 1997). In this science-fiction story, American scientists from SETI capture radio broadcasts from space. An intelligent civilization is living in some part of the Cosmos… And Vega is the origin of everything!